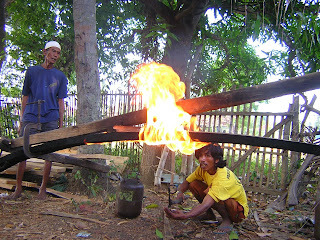 Lance Lee emailed me concerning a comment my previous post about the Indonesian gole'an Lancing Madura. 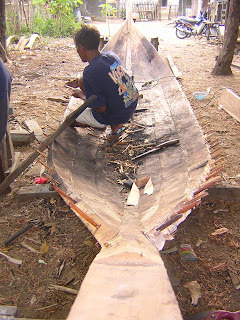 The boat is not, he says, dugout-based, but rather, it is "shell" construction, in which the planks are pegged to the keel and each other, before internal framing is added. While the keel seems to have some hollow carved into its upper surface, it's a far cry from a dugout hull. Sorry for the misinformation, and thanks to Lance for the correction. 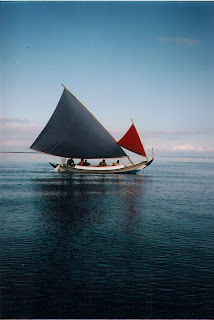 My August 26 post about the Indonesian fishing boat Lancing Madura included only a small photo, and some readers rightly asked if a larger one was available. 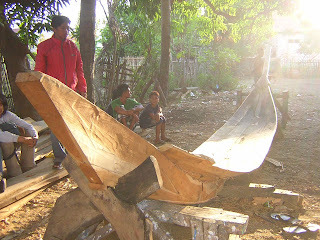 It took me a while to get hold of one, but here it is, along with a series of photos showing this Java Sea fishing gole'an under construction. The boat is on a mooring in the Rockland, Maine, harbor, and a very striking boat she is, with a lovely sweeping sheer. 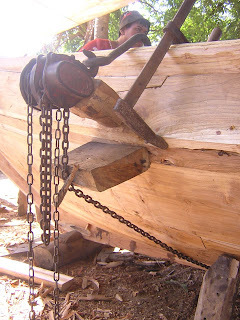 A lot of fascinating material about traditional Vietnamese boats can be found at the site of the Vietnam Wooden Boat Foundation. Based in Port Townsend, Washington, this not-for-profit's purpose in life is to preserve the traditional boating heritage of Vietnam before it becomes extinct as, almost everywhere else, the traditional types are being rapidly supplanted by modern ones, and the experienced builders are fast dieing off. 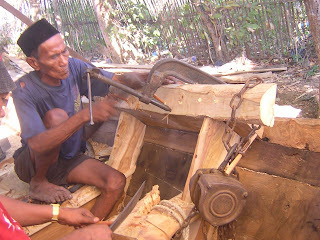 The Vietnamese developed several unique and/or unusual methods of construction. 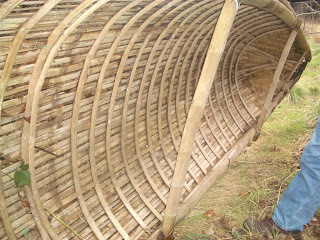 These include several types of sewn-plank boats and boats woven from narrow strips of bamboo. 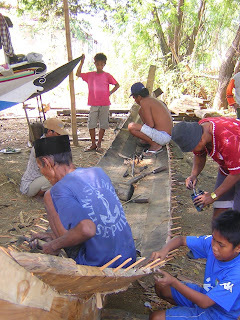 Some of the sewn-plank boats appear to be built with extraordinarily heavy planking. 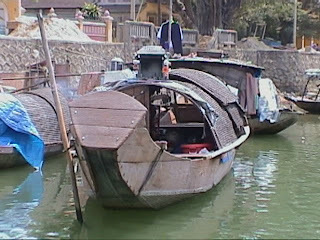 I believe that buffalo dung is used to waterproof the woven boats. The VWBF has an ambitious program of projects, including the building of a Ghe Nang, which it describes as "a graceful Vietnamese 3-masted sail-powered fishing boat typically built with a woven bamboo hull fitted to a wood top shelf. 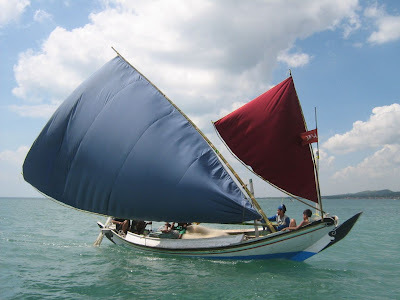 She was from the region around Danang in central Vietnam and was considered the fastest sailing craft in Vietnam." The organization plans to locate some of the elderly builders of the type, construct a 30' to 36' example, film and document the process, test sail it, and ship it to the U.S. for display. Estimated cost: $75,000. 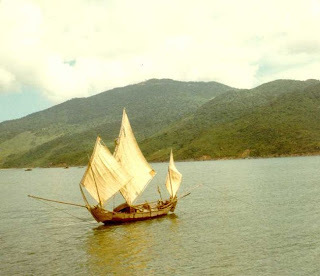 Other projects include: the translation of J.B. Pietri’s Voiliers d’Indochine into English (completed and published as Sailboats of Indochina, link below) and Vietnamese; and the creation of a maritime heritage museum in Vietnam -- both worthy pursuits. I don't know anything about the sampan below except that the photo was taken in Hue, and I find high, inboard-sloping bow transom a fascinating feature. All photos used with the kind permission of the VWBF. International Marine has released a new edition of David Burch's significant book, Emergency Navigation with a new subtitle: Find Your Position and Shape Your Course at Sea Even If Your Instruments Fail. This valuable book has been out of print for a few years and it's good to see it back in print. "The concept of a star path comes from island navigators of the tropical Pacific. The 'path' is a sequence of stars with nearly the same declination, which means they rise at nearly the same place on the horizon throughout the tropics (the Tropics Rule). By learning the sequence for the bearing from one island to another, Polynesian navigators have, in essence, established sets of celestial sailing directions. They follow one star as it rises above the horizon until the next in the sequence appears, at which time they shift to the new star for orientation. In this way, they keep track of a particular bearing on the horizon throughout the night. The same technique can be used with setting stars. It is easy to see how indigenous star paths could evolve into finely tuned routes that account for both prevailing currents and the leeway of traditional craft. Poor choices would be removed from the lore by natural selection." Burch doesn't confine his methods to traditional ones. The book is based on the presumption that one or more essential navigation tools are lost or malfunctioning -- your compass, your chronometer, your tables, whatever -- and he demonstrates how to use whatever is available to make up the deficiency. At one point, he shows how to use a pair of polarized sunglasses to find the sun when it's below the horizon or obscured by clouds. So while a lot of the material is based on indigenous methods, a lot of it isn't. Worthwhile for any navigator, bluewater or coastal, nonetheless. By the way: in spite of its title, Fundamentals of Kayak Navigation is by no means a basic text -- it's quite comprehensive and as such can be somewhat intimidating and more than many kayakers need. For a simpler approach, check out Ray Killen's Simple Kayak Navigation, below.